This delightful and colorful Beachside Two condo is called a 'TWEENER' in some rental programs containing 932 square feet to enjoy. It has 2 bedrooms and 1 bathroom, so we rent it for the same as a one bedroom except the additional cleaning fee. It's a great advantage with families and children because it sleeps up to 6 people comfortably, with sleeper sofa included. Put the kids to bed and enjoy the living room ambiance as late as you like. 2 couples could certainly share the bathroom and save some money. This unit is in high demand because of the lower price (rented at the rate of a one bedroom) and because of its convenience to the pool, with direct access on your floor to the gulf. Rated Elite, this unit has been renovated, with granite and stainless upgrades in the kitchen and bathroom, crown molding in every room. Painted a lively yellow, the condo is tiled throughout, and funky original artwork compliments the caribbean style of the furnishings. The condo is conveniently located on the 2nd floor directly over the gorgeous heated pool with an awesome view of the gulf. There is a tiled lanai for enjoying those special sunrises and watching the gulf while the kids play in the pool. Easy walkout access to the pool deck and the gulf. The unit has a 37'flat screen HDTV in the living room. Both bedrooms have TV/DVD as well. Enjoy a drink at the beach bar right in the sand next to the condo, and listen to the entertaining music on weekends from the condo lanai. There are 4 on site golf courses which now allow junior players to play at a sizable discount with their parents. Many on site restaurants on both the beach side and the bay side of the resort offer a huge variety of choices without ever having to leave the property. THIS IS A VACATION WHERE MEMORIES WILL BE MADE! We loved our stay in this condo! It had been advertised as being painted soon - and it did need a new coat of paint and other touch ups that would come with painting. However, the location with the resort was perfect for unloading our car, proximity to the pool and beach, and everything we needed during our stay. The two bedrooms were a huge perk, as in this price range, you normally only get a pull out sofa. The kitchen was a little tight when two of us were in there - but we were rarely in the unit itself. The mirrored wall made the unit seem much larger than it actually is. We will definitely return. Thank you and that is what I am here for. Destin Memories wants our guests to have a great vacation realizing we are here to help in whatever may is needed. Very nice and clean. Great view. Will be renting from them again. Great Condo! Excellent location. Balcony has great view. The tram was super convenient to Baytowne. Most all of the rides were quick and enjoyable. Only had 2 in a week that took a considerable amount of time to get picked up. Only concern is that there isn’t a deadbolt as well that can be locked from the inside to prevent kids from walking out of the unit. There is a child safety latch up high but a deadbolt would be nice as well. Thank you for your response and suggestion. We will certainly look into that. One noisy night in a great trip. Perfect experience, thanks to Destin Memories. Feedback before and after booking was excellent. Notes on unit: This 2nd floor unit has access problems for mobility challenged. Must walk up 2-3 steps to get to hall and each unit on hall has a 2-3 inch threshold to step up at each door. We also had wedding party few doors down playing loud music and going in and out of door, slamming it, on one of our nights. They lasted well into wee hours. Access to beach/pool was perfect, very near short stair down to pool and boardwalk level. Unit was well equipped. Obviously, we have no control over the 2 or 3 steps to the hallway nor the neighbors, but you can always call security. I am glad the unit was perfect and we attended your needs well. Great condo...something for everyone at resort! Our family of four fit perfectly in Unit 4221. 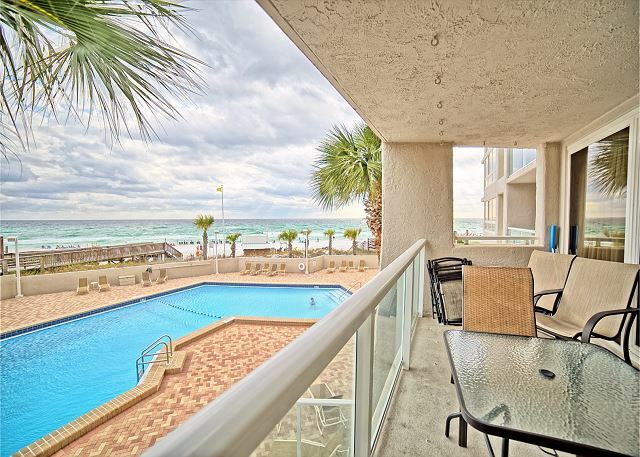 We reserved the condo easily with Bette at Destin Memories. She was very helpful and answered all of our questions before we arrived. We needed to call while we were there for a broom. A broom was delivered within 30 minutes of our call. The condo was clean and updated. Love the fun, beachy quilts and decor. It is located on the second floor, just above the pool, overlooking the beautiful beach. Great location! The kitchen is stocked well. The pool is nice. There is a shallow end and a very deep end. The fitness equipment consists of a couple excercise bikes and treadmills. Not too exciting. The resort has something for everyone. If you need a break from the beach, there are basketball/tennis courts, walking/bike trails, golf courses, etc. Baytowne Wharf is also on the property, and there you will enjoy lots of shops, restaurants and a marina. Sandestin Beach and Golf Resort is also in close proximity to many more good restaurants and great shopping. You will not be disappointed! We are so glad you see what a jewel this unit is! Our booking process was flawless. No issues except the unit wasn't very clean when we got there but an inspector came and made that all right. She mopped and cleaned the toilets and counters. My literal only concerns about the entire stay was the cleaner cleaned everything with windex when I'm not sure how good of a cleaner that is and our comforters and the couch were pretty dirty. We covered the couch with a sheet and used our own blankets so it wasn't a big deal at all . That is all. Everything else was perfect and fixed. When I mentioned there wasn't a lot of hot water it was fixed within the hour... and when I mentioned the umbrella was broke we had one within the hour. We were grateful for a vacation at beachside 2 once again. The cleaning company has been notified and when they come in for follow up, they don't have their standard cart of supplies. Thanks for letting me know about the couch. I will have it cleaned as well as comforters.. Come back again as you have for several years now. We had a wonderful time at Beachside II, condo 4221. Easy access to the beach, nice swimming pool, enjoyed amenities such as workout room, ice, umbrella. Jimmy, we are so thankful you see the value of the great unit which is easily accessible to pool and beach or getting to your car without the need of the elevator, another bonus. Great location and beach. The location of the condo was right off the beach access and the view from the balcony was excellent. The most disappointing thing was the patio furniture which was cheap an to big for the space and the balcony does not have the iron railing in the picture. For some reason they now have Plexiglas type of material that stays cloudy from the salt spray all of the time so if you sit down on the balcony the view is blocked. I am not sure of your scoring system. I am glad you enjoyed the view. Most guests really like the new change to Plexiglas. We'd love to have you back. Easy to work with company, no hassles at all! Betty was great to talk too!! Fun week we had! 3 sisters getaway was perfect! We will be back and soon!!! The condo was nice. Perfect location for being close to the beach. The tub drain was slow and the tile was a little sandy when we first arrived but thankfully there was a vacuum to use (of course you can't expect things to be absolutely perfect and sand just comes with the beach)! Bathroom could use a little updating But over all a clean place. I would recommend this place! The beach view is simply hard to beat! :) This property is well kept and was a great accommodation for the two days we were in town. The location is great. It was great having the beach items for use, too! A few things could make the space even better: * Additional lighting or brighter options in the master bedroom. I don't remember the lighting in the second bedroom as we didn't spend much time in there bc it was better for our toddler to sleep on the couch bed. * Better stocked kitchen - The description mentioned a fully stocked kitchen so we anticipated everything that we'd need. If it was there, ignore this statement, but items were throughout the cabinets and discouraged us from looking for what we needed. It may be good to update the space with an all-inclusive set of kitchen goods. * We did not see a ramp to access. If there is one, it was not easily marked. We loaded items onto the luggage carrier, got to the steps, and had to unload to get things inside. Not a biggie bc we were able to, but what if there is a guest who can't take steps? We are glad you enjoyed your stay. A lot of the kitchen items are stored in a closet directly across from the kitchen, so if you missed that we do apologize. I will certainly address the lighting in the bedroom. As for the ramp, that is a building issue that I have no control over, but will certainly bring it up to management. Condo was nice and clean. Advertised heated pool. The pool water was almost cold as ice. Barely heated. That was bad. Would rent again - in the summer.